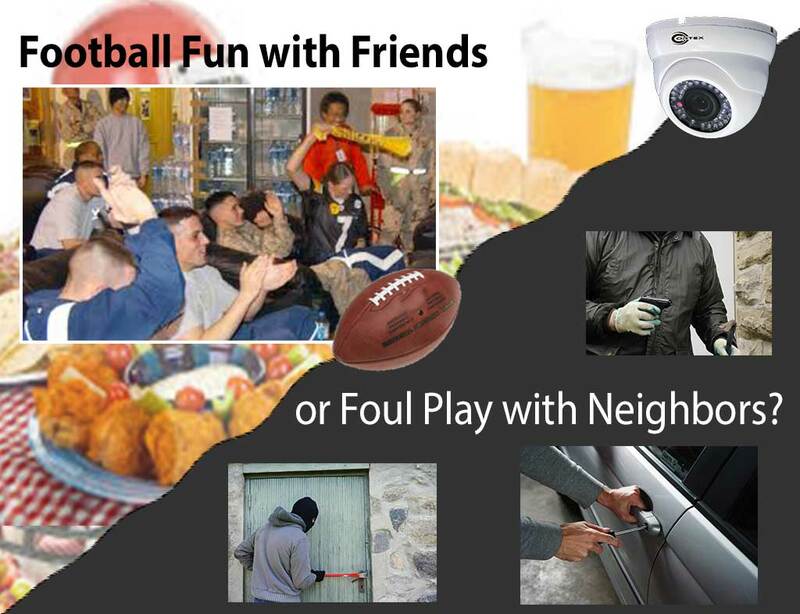 Football Fun with Friends or Foul Play with Neighbors? Football Fun with Friends, Family and Neighbors! Many people are looking forward to having a fun time watching the football playoffs. This is a great time to get together with friends, family and neighbors to watch your favorite NFL team go for the big win. A lot of neighborhoods engage in block parties with cookouts and fun activities during this time. This is also a great way to socialize with neighbors to catch up on the latest news or gossip that is circling the neighborhood. "Why is it important to know what's going on in your neighborhood?" Keeping yourself informed of any changes or incidents that have occurred are important to know because they might affect you! When making a decision to move into a new home, a lot of research is done to find just the right location that fits all of your requirements. You may end up with some compromising when choosing your perfect home, but the end result will be to find a great home in a good community. We don't always consider that once we buy a new home, whether it will come with great neighbors. "How well do you really know the people in your neighborhood?" Unfortunately, we can't always choose who we live by, so it's a good idea to try to get to know your neighbors. Here are some good tips to helping yourself be more watchful in your community. Taking walks around your neighborhood and talking to other residents is a good way to be more familiar withwho lives in the area. A friendly hand gesture and smile can give your neighbors a "good vibe" that nice people live nearby. A lot of neighborhoods have rental properties where it's hard to be familiar with people who aren't permanent residents. Attending a social event is a friendly way to get to know neighbors to hopefully set things off to a good start. Things may go well in the beginning, but can soon fall apart after. Neighbor disputes are nothing new, however a little quarrel can quickly turn into a nightmare. Unresolved issues can lead to constant harassment, property vandalism and even theft. When out enjoying a day of fun, your home could be a target of vengeful antics from a disgruntled neighbor. Several hours with your home unprotected can mean several dollars of damage or stolen property. Protecting your home and family is top priority when your at home or away. When needing to capture the slightest criminal activity, installing an HD-SDI security surveillance system will give you protective monitoring at all times. Positioning HD bullet or dome cameras to the exterior perimeter of your home can be quite effective in catching the offender in the act. Easy remote viewing through the internet, iPhone and android, gives you quick access at your finger-tips. Give yourself peace of mind by keeping one step ahead of criminal activity. Having a security system gives you a good advantage for home protection, but also having a good relationship with your neighbors has it's benefits too! Your neighbors can help watch your house while your away by checking your mail or watering your plants. Most importantly, they can help by watching out for suspicious characters or activities around your home. Lastly, getting involved in your neighborhood watch and being an active member in your community is a good way to help build a safe environment for you and your family. After receiving word from a friend that something strange is going on, there is nothing like the peace of mind that security cameras can bring to a worried home owner! Thank you for taking the time to view our website. As a homeowner, you need to be protected. We here at CCTV Core have our "EYE" on surveillance and are here to help you with your security system needs. We hope you enjoy your fun time event!